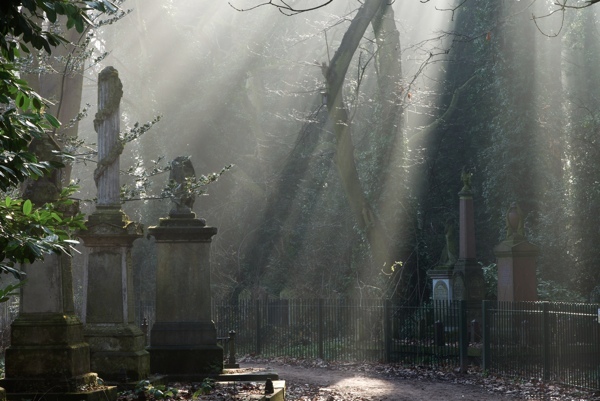 Photographer Duncan George sent me these pictures of Bow Cemetery at dawn, inspiring me to pay a visit at first light yesterday. With the passing years, each winter seems to present a greater challenge to my resilience and – sometimes – as I lie in bed pulling the covers closer to keep warm in the cold of the old house, I can almost feel the chill gathering around me at night. Yet rather than cower behind my feeble defences any longer, I decided to venture out before dawn into the freezing mist in the hope of ameliorating my aversion to the grim weather. A generation ago, Brick Lane would have been alive at six in the morning with people going to work in the clothing factories, and at the brewery and the market, but yesterday no-one was stirring except me. There was an artificial glow to the west from the lights of the City as I set out to walk down the Mile End Rd, but otherwise the low cloud which obscured the sky was grey – turning uniformly luminous by the time I turned into Southern Grove. 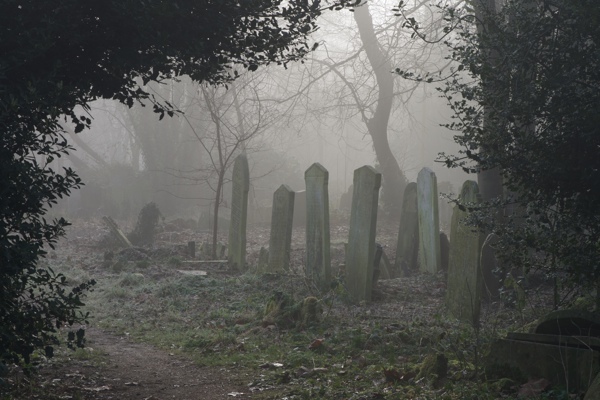 Passing between the high walls of Bow Cemetery, I encountered moisture in the air and a pang deep in my stomach. Even at this hour, the trees and the natural life of the place overwhelmed the presence of the tombs, and my first impressions were of wild cherry blossom glowing in the half-light and the first catkins of the year hanging from bare branches. 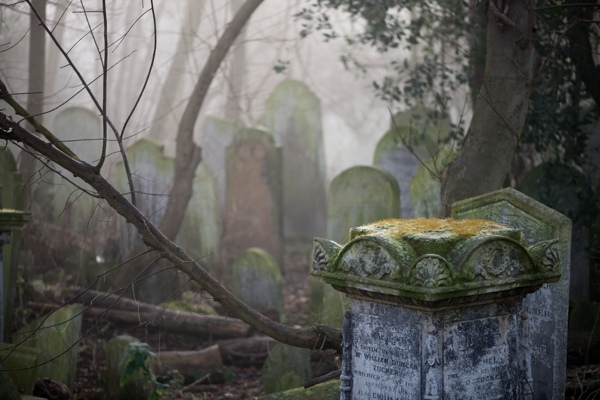 Nevertheless, I could not help myself scanning the gravestones for any signs of movement and, spying a moving figure that I assumed to be an early dog-walker, I turned in the opposite direction walking deeper into the maze of overgrown paths. Above my head, birds were singing in chorus from the forest canopy, yet it only served to emphasise the stillness at ground level, where I stood among funerary statues that were poised as if ready to spring into movement. 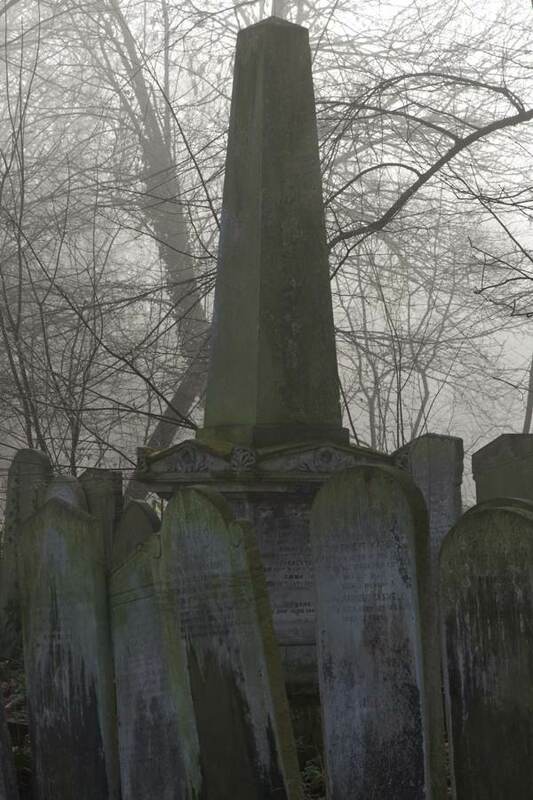 Overhead, a subtle balance was shifting as the streetlights, which I saw in every direction, were losing their dominance over the cool gloom of the cemetery where snowdrops sprang luminous in the shadowy haze. In the distance, a disinterested fox barely adjusted his pace upon registering my existence. In my fantasy, it was the coldest, chillest place – the locus of winter. In reality, there was life there, ticking over and marking the slow advance towards spring. 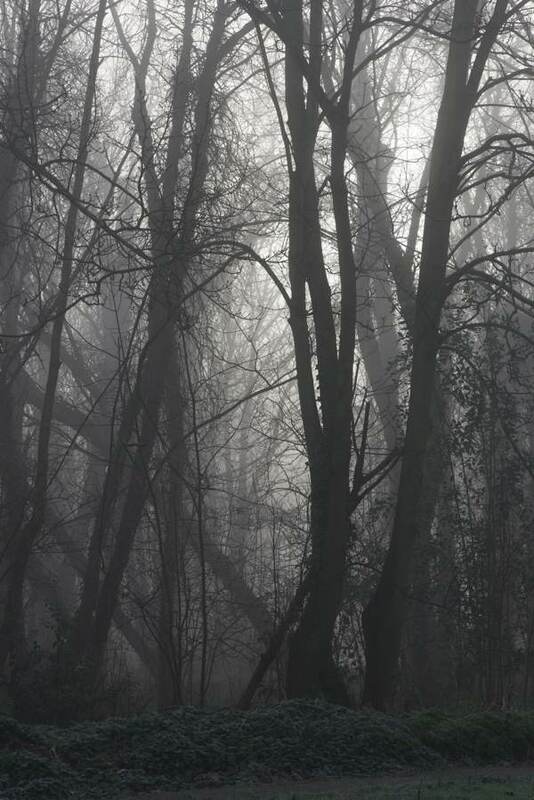 I stood in a clearing, slowly lifting my gaze to the tree tops as the day broke. Once upon a time, I could never have been there to see this. Even well into adulthood, I could not walk into a dark room without switching on the light for fear of unknown horrors. One summer, I lived in a cottage at the end of a wooded lane and, if I returned at night down the dark road through the trees, it would always be with my heart in my mouth. Experiences that are absurd in retrospect as, through the intervening years, these irrational terrors have - inexplicably - receded and vanished from my psyche. Yet I did not linger that morning and, as I walked, night faded from the cemetery. In spite of the Gothic statuary, I was relieved that my experience was not of the Gothic variety, save the mysterious lone figure moving amidst the stones, that I did not see again. There was no unholy chill. Neither were there dog-walkers or joggers, as I had expected. On such a morning they had stayed at home. 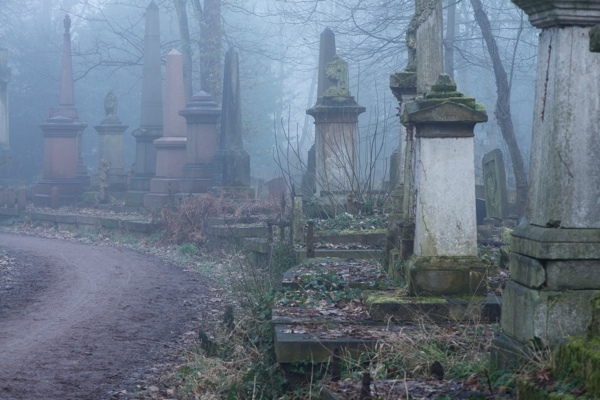 I wondered if I was alone, until I reminded myself that you are never alone in a cemetery. In the Mile End Rd, street lights were flickering out and the first commuters were to be seen upon the glossy damp pavements, making steps to towards the tube. In Vallance Rd, I passed Kevin the Milkman and arrived home to discover his delivery on my doorstep, and thus I was grateful to return to my warm bed again. Gorgeous pictures and prose. Another fabulous post – thank you. Did you notice the mysteriously haunting hooded figure which appears in the first photo after the text. Look immediately to the left of the monument. Be careful in the dark. 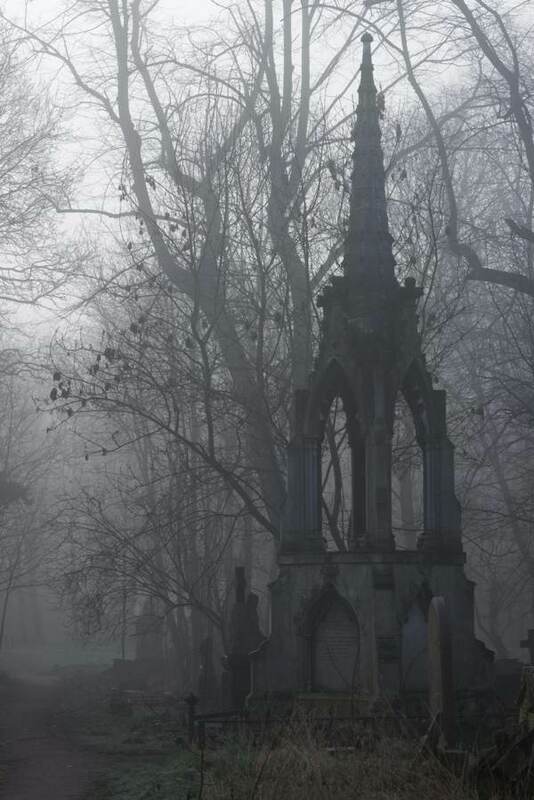 It looks a beautiful cemetery. Wonderful post and photos. As ever some great photos. 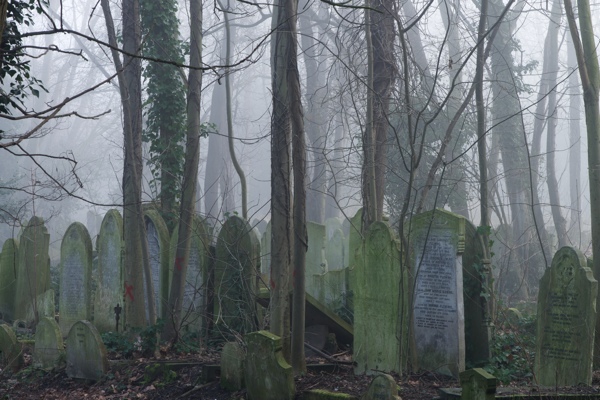 Cemeteries really lend themselves to photography. 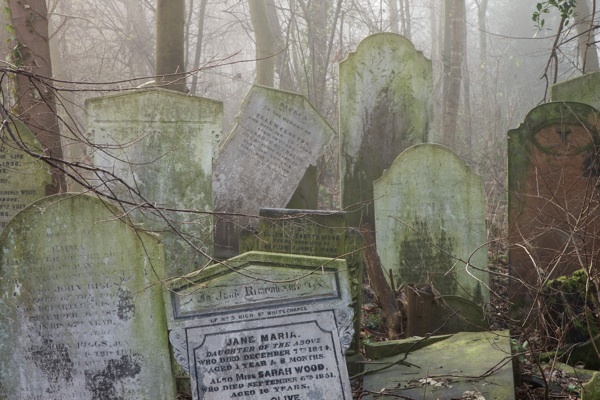 In our area we have tombs constructed by wealthy mill owners – very ornate and austere – but now being taken over by encroaching brambles and rhododendrons. It’s almost impossible to take an uninteresting photo. Stunning pictures and great writing! You write so beautifully and convey so much atmosphere. I love these posts about Spitalfields. I’m kinda jealous that you have a milkman who delivers milk to the door. That’s long gone in America, but I remember it from my childhood. It was so nice, leaving a note in the empty bottles for what you wanted that day. Leaving payment too! You couldn’t do that now, it would be gone! Hey Big T… I wonder how many viewers scrolled up to look at that photo after reading your comment? I certainly did! Great photos, very atmospheric. I so love the peacefulness of graveyards and looking at the dedications on the stones. 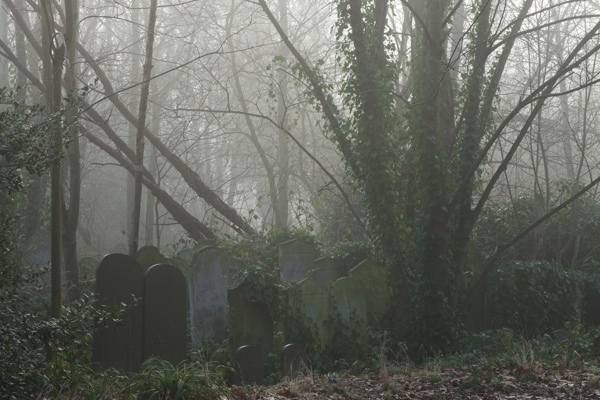 A few years ago I was very ill and visited my local graveyard often, it made me face my fears. In very old cemeteries I am always struck by the ages of the children laid to rest, it gives a very real picture of infant mortality down through history. For anyone on a visit to Scotland, I can recommend a walk through the graveyard behind the Dean Gallery (Scottish Gallery of Modern Art) in Edinburgh if you have an hour or two to pass. Cherub… I shall be up in Edinburgh in August so will do as you say and visit that graveyard. I think some of my distant relatives are buried here, and here I am in nearly outback australia looking at them. Beautiful writing and photography. I look forward to all your daily posts and read them avidly. 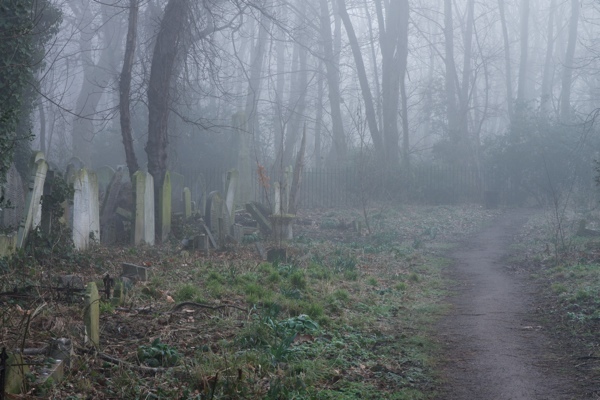 What great Duncan George photographs viewing the cemetery. Capturing it at dawn was certainly a treat and I agree, “you are never alone in a cemetery.” I enjoyed reading this and glad you made it back home in time for the milkman’s early morning delivery. Beautiful, atmospheric writing and photos. 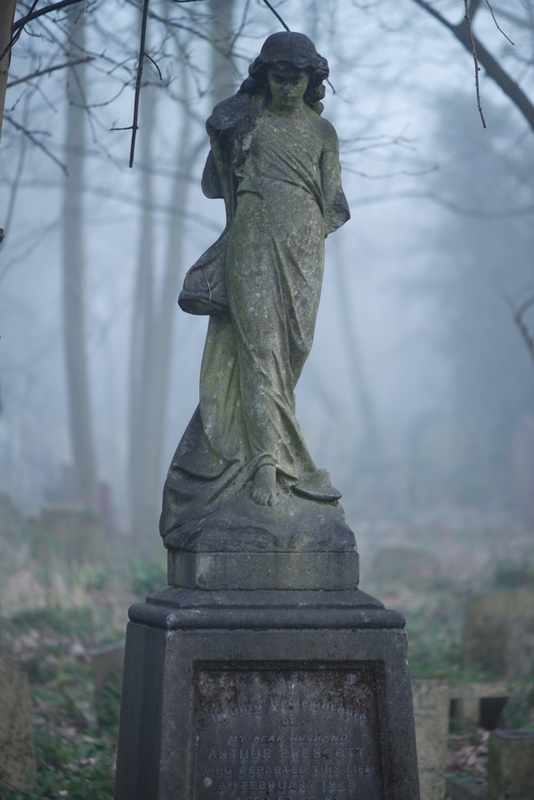 Bow Cemetery is one of my favourite places in London, I always go there whenever I’m on a visit. This post makes me want to get on the plane right now!